Being able to use learning strategies and study skills can empower students to become independent learners. What learning strategies and study skills do English language learners need to support their language learning journey? Bonnie Jean Nicholas (@EALStories) and Jennifer Chow (@jennifermchow) moderated a #CdnELTchat to explore this topic. Q1: Do you distinguish between skills and strategies? How? How do you define these terms? Q2. Do you think learning strategies and study skills need to be explicitly taught to students? Why or why not? Q3: What learning strategies and study skills do you teach your students? Q4: What paper-based or digital tools or apps do you introduce to your students to help them study? Q5: How do you (or do you) teach the “soft skills” (people skills, emotional intelligence) necessary for success, like stress management, anxiety reduction, and time management? Is there room for this in your program? If you have never participated in #CdnELTchat before, go to www.lincchat.ca for more information. #CdnELTchat is self-directed PD, so you determine the level of your involvement. #CdnELTchats usually occur every other Tuesday, with occasional exceptions. Feel free to use the #CdnELTchat hashtag between chats to share thoughts and links with others. 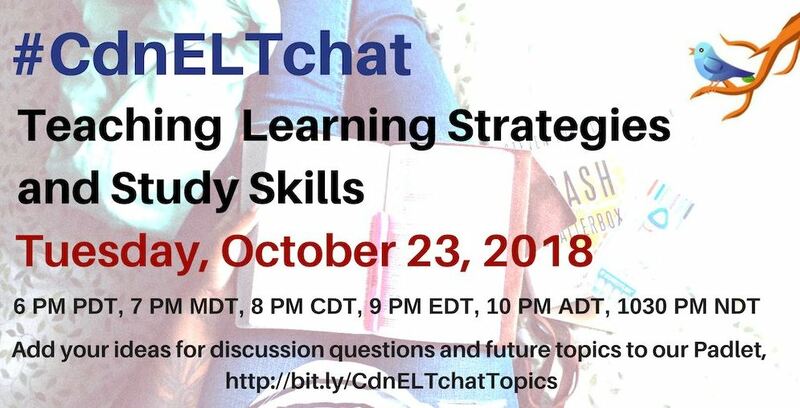 If you have any have comments about #CdnELTchat , please send @StanzaSL, @EALStories, @Jennifermchow, or @LINCinstructor a tweet. 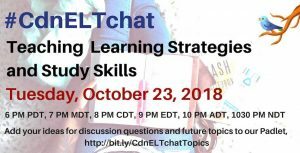 Please join us for the next #CdnELTchat. Add your ideas HERE.